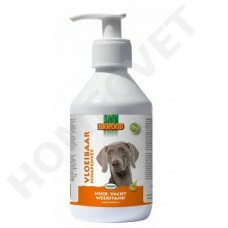 This product is a combination of sheep fat, sunflower oil, salmon oil, dextrose, glucose and added vitamins. The Sunflower oil and salmon oil contain essential omega fatty acids 3, 6 and 9 that take care of a better digestion (better food absorption, less faeces), and are beneficial to the heart and blood vessels and ensure a magnificent coat. Ideal for both dogs and cats. Available in siphon bottle (500 ml). Sheep fat, natural oils and fats, sunflower oil, vitamin E Salmon Oil + C, B ​​vitamines, Tocopherolen, Omega 3, 6, 9 Vetzuren, E 50 Lecithine, glucose / dextrose. Start with 5 ml per day. Then 15 ml per 20 kg body weight.